For Palace Place residents looking for a change, this is an incredible opportunity at Parklawn and The Queensway. The open house is this Saturday, April 28 and Sunday, April 29 from 2 to 4 PM. Backing onto the Mimico Creek, Townhouse 2 is a magnificent, rare freehold townhouse residence, with approximately 2,000 square feet of living space, plus a private sundeck on the third floor that offers enchanting views of the city skyline and Lake Ontario. 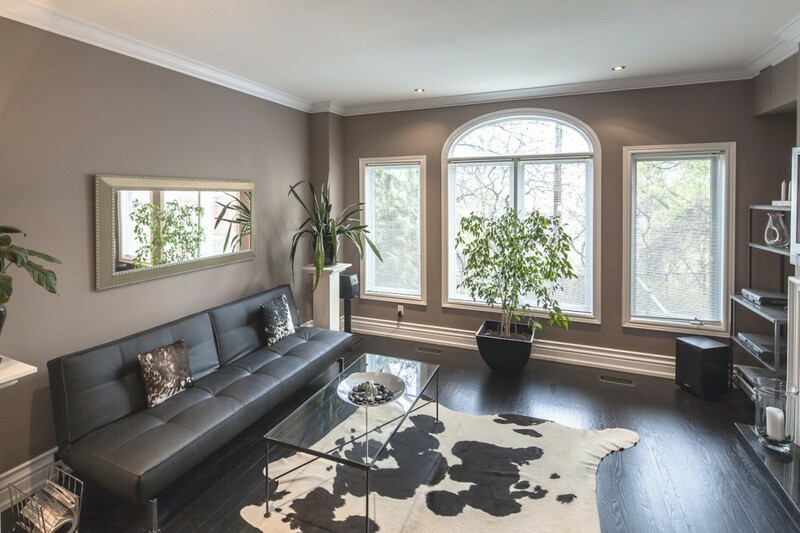 This home is located on an upscale, wooded ravine enclave in prestigious South Etobicoke. This home features an uber cool, renovated kitchen, with granite counters and new stainless steel appliances, stunning, dark-stained hardwood floors, three designer bathrooms, and a ground floor family room, with walk-out to lush, professionally landscaped grounds. Natural light floods the whole home. This is an ideal home for families, who want the convenient and carefree lifestyle that a luxury townhouse offers. 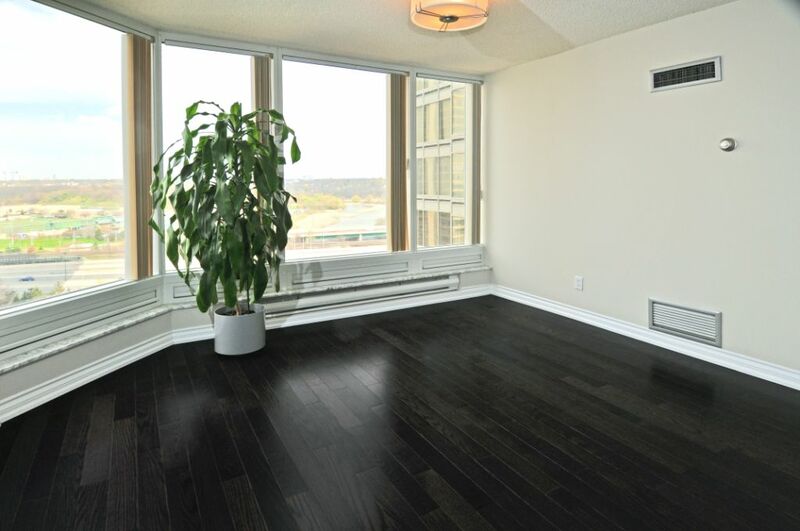 This residence is located in the historic Queensway village, one of Toronto’s up and coming neighborhoods. The Queensway had been founded in the 1800s as a small rural farming community. A white stucco cottage that sits on an old farming field at 694 Royal York Road has stood the test of time, serving as a reminder of the past and of the pioneering men and women, who had left their mark upon the landscape. In 1912, The Queensway had begun to grow quickly from the urbanization by Eastern European immigrants, who had innovatively developed the area and its businesses. During this time, Queensway Public School had been built to serve area residents. During the mid-1990s, this historic school had been demolished to make way for the current Costco store, which has played a significant role in the revitalization of the area. The Queensway has quietly earned celebrity status for the many television, movie, and commercial productions that have been filmed in and around Queensway Park. The Queensway is close to some of Toronto’s best shopping and dining destinations, the best schools, beautiful parks, and quick travel times to the Greater Toronto Area and the airport, via car or public transit. 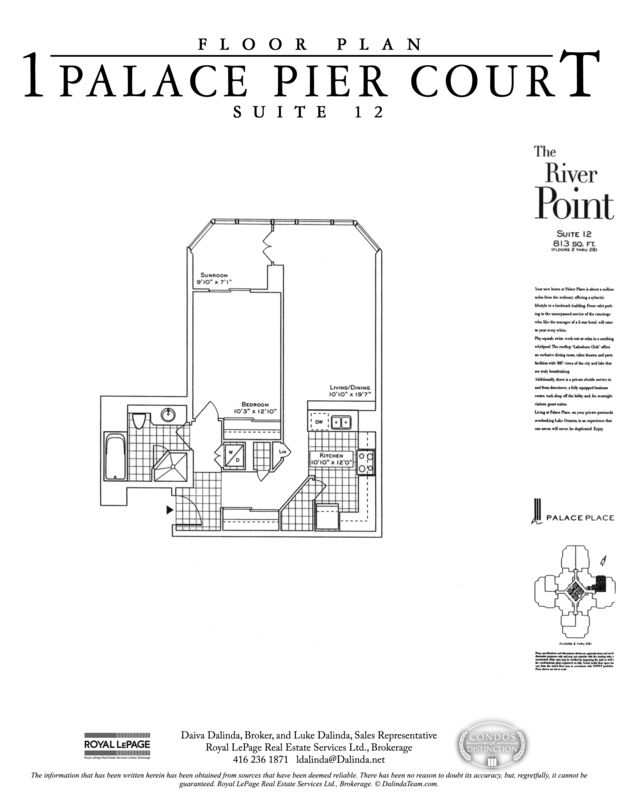 A 03 suite has just been listed at Palace Place, 1 Palace Pier Court. Breathtaking is the word that best describes Palace Place, which is the most prestigious, luxurious, and best managed waterfront condominium residence in Canada. 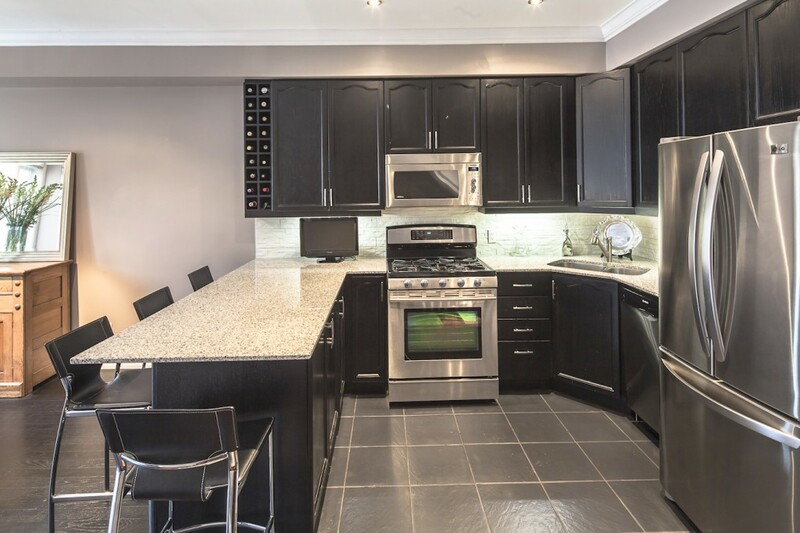 Suite 1707 is a stunning, newly renovated condominium residence, with approximately 788 square feet of living space and beautiful Humber River views. Click for flyer. Call or send an email now to Luke. 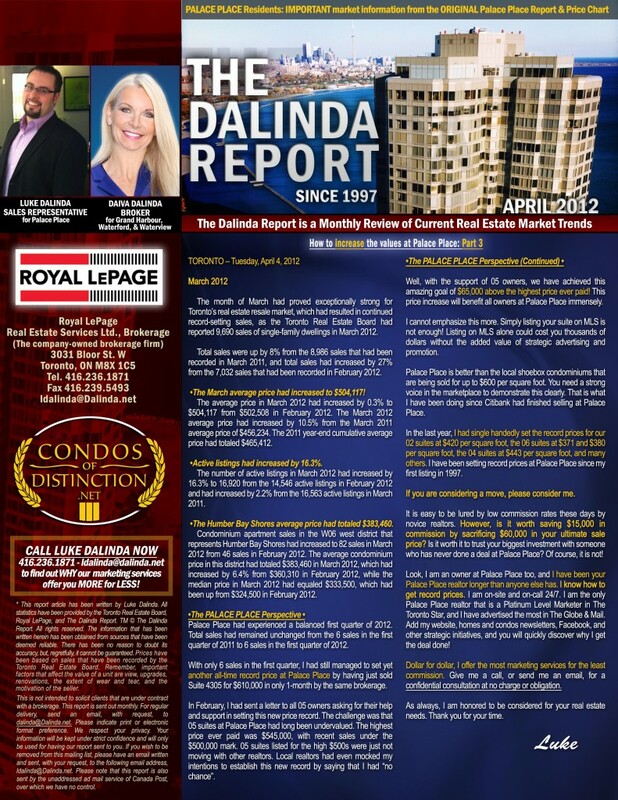 The Dalinda Report, April 2012, is out! How to increase values at Palace Place: Part 3. 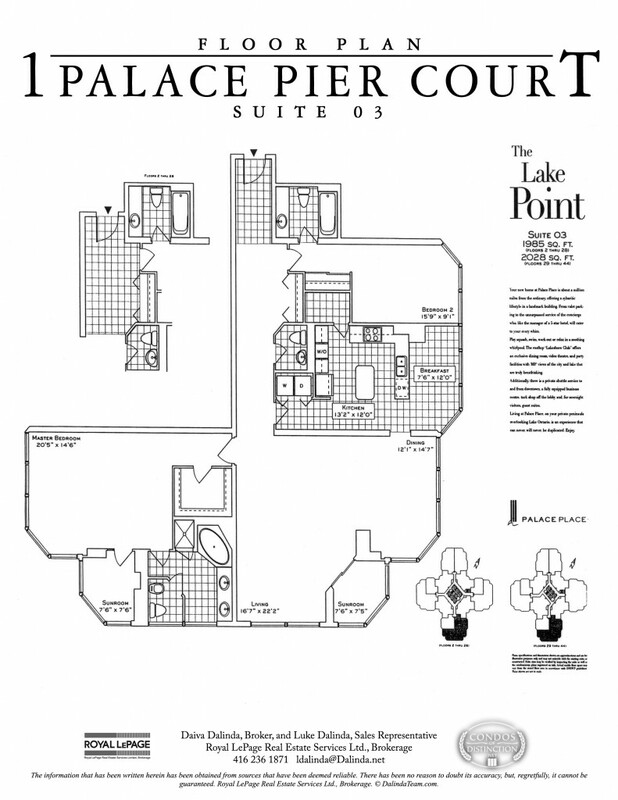 Palace Place had experienced a balanced first quarter of 2012. Total sales had remained unchanged from the 6 sales in the first quarter of 2011 to 6 sales in the first quarter of 2012. 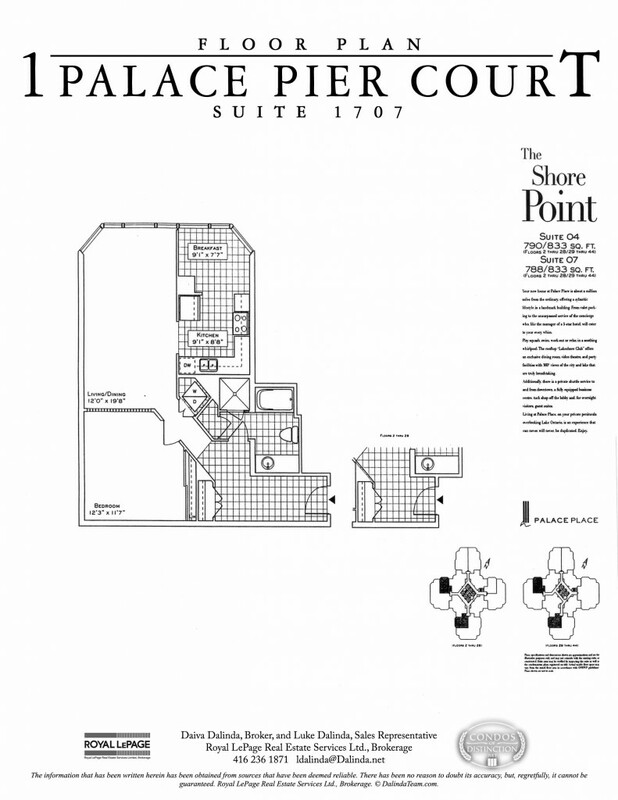 With only 6 sales in the first quarter, I had still managed to set yet another all-time record price at Palace Place by having just sold Suite 4305 for $610,000 in only 1-month by the same brokerage. If you are considering a move, please consider me. It is easy to be lured by low commission rates these days by novice realtors. However, is it worth saving $15,000 in commission by sacrificing $60,000 in your ultimate sale price? Is it worth it to trust your biggest investment with someone who has never done a deal at Palace Place? Of course, it is not! Look, I am an owner at Palace Place too, and I have been your Palace Place realtor longer than anyone else has. I know how to get record prices. I am on-site and on-call 24/7. I am the only Palace Place realtor that is a Platinum Level Marketer in The Toronto Star, and I have advertised the most in The Globe & Mail. Add my website, homes and condos newsletters, Facebook, and other strategic initiatives, and you will quickly discover why I get the deal done! 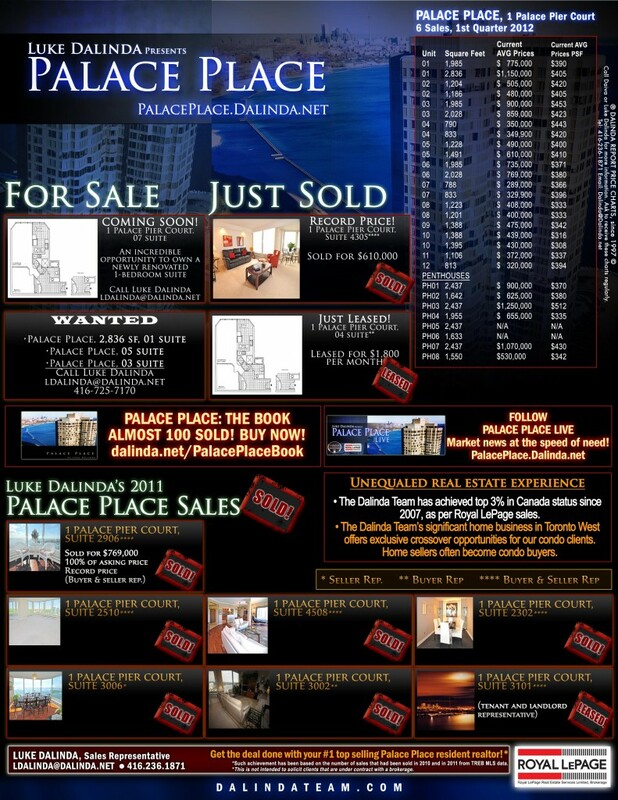 Buyers of new condos will have to pay higher deposits, making resale condos, like Palace Place, far more appealing. Canadian banks have tightened lending conditions yet again. This time the focus is on the builders of new condominiums amid fears of a condominium market bubble. According to the Canada Mortgage and Housing Corporation, multiple-unit starts in Toronto had more than doubled in January 2012 to 2,999 units compared with January 2011, while starts had risen 4 % in Vancouver to 1,261 units. Increasing home sales and prices driven by the lowest interest rates in decades have pushed household debt to record levels, leaving many families defenseless to an expected rise in borrowing costs. To help the market, Canadian banks have begun to demand that a higher percentage of condominium units must be pre-sold and to demand higher deposits, as conditions for financing. OSFI, the regulator of Canadian banks, has already increased supervision of residential lending practices. “The Toronto market is dominated by a small number of very powerful developers,” OSFI had stated in June 2011. “Their role in supporting or discouraging pre-sale speculative activities would appear to be very inconsistent, with little transparency,” OSFI had added. “Less well-established companies may have difficulty getting loans from the top Canadian banks, even if they have pre-sold 70% of the units, collected 20% of the total purchase price in deposits, and can offer 15% of the project’s value in equity,” a top expert had noted. “There may, for instance, be some vulnerability in the condo markets of Vancouver and Toronto,” Royal Bank CEO Gordon Nixon had said recently. 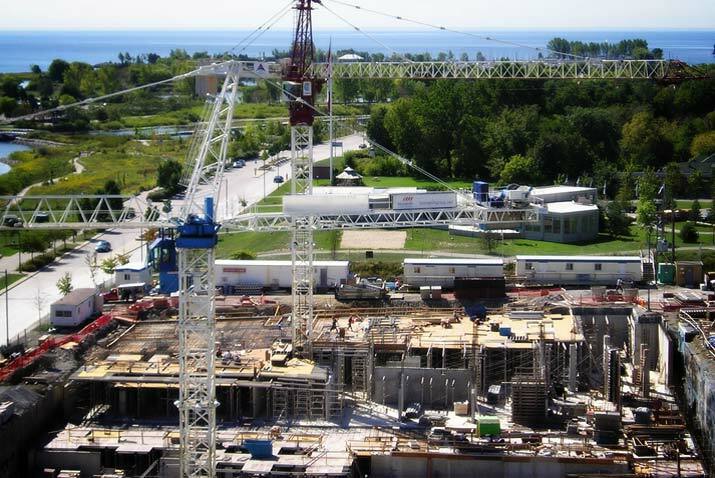 “The large number of construction cranes crowding Toronto’s skyline is raising concern of an emerging oversupply of high-rise housing,” Bank of Nova Scotia economist Adrienne Warren had said this past week. “Slowing price appreciation should dampen investor demand and new product launches,” she had added. Surprisingly, Toronto has more skyscrapers and high-rises under construction than any other North American city and almost three times as many as in New York City. Despite such concern, the World Economic Forum has ranked the Canadian banks as the soundest in the globe. For Palace Place, this news is good. Having to pay larger deposits for new construction will make resale condominiums, such as Palace Place, far more appealing to buyers. This is just yet another of the many benefits of buying at Palace Place. It may also help to derail some of the many shoebox condominiums going up in the Humber Bay Shores area, which would serve the over developed area well. This will also encourage better condominium proposals from developers looking for financing. Developers will have to become more creative in demonstrating the market for what they intend to build.